Welsh actor Alexander Vlahos has become famous in the fantastic genre through his role in the BBC television series Merlin. As Sir Mordred, first Druid and finally Knight of Camelot, he mortally wounded King Arthur – but then had to give up his life in return. Vlahos studied acting at the „Royal Welsh College of Music & Drama“ in Cardiff, where he graduated in 2009. Currently, the Welsh man can be seen as Monsieur Philippe d’Orléans in the TV series Versailles, which deals with the exciting history of the castle of the same name. In addition to participating in a number of other series (including Private Keenan in the BBC drama Privates), Alexander Vlahos is repeatedly drawn to the boards that mean the world. One of his most famous performances here is certainly the role of Malcolm alongside Kenneth Branagh in the Shakespeare masterpiece Macbeth. 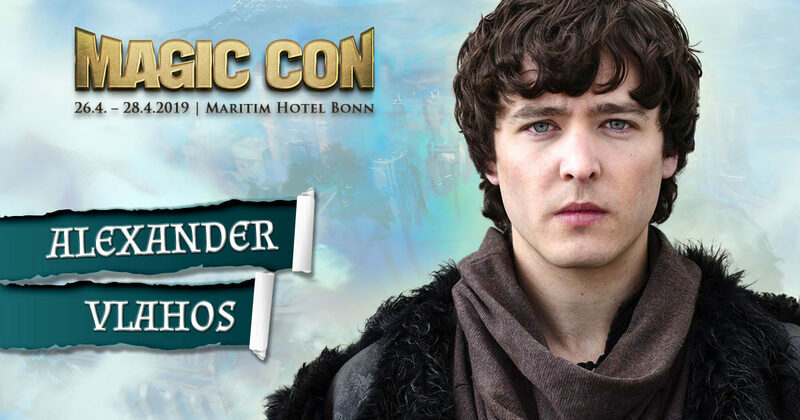 We are already curious to see what exciting stories Alexander will tell on the stage of MagicCon.